Mirik, is a small but quaint and scenic tourist spot nestled in the serene Darjeeling hills. Though very recently developed it does not stay behind in offering you the perfect escape from the stint of the pain summers. Its center of attraction, Sumendu Lake, a 1.25km long lake fed by perennial streams, flanked by a beautiful garden on one side an exquisite alpine slope on the other linked by an arching bridge. Very often you can get a different experience of viewing the Mt. Kanchenjunga not above but reflected in the lake waters. You are sure to enjoy a walk around the lake or a boat ride in it. Remeetay Dara, providing a panoramic view of the surrounding mountains and the plains below, Bokar monastery offering you an ideal meditation center and the orange orchards in the country side adding the perfect color to make Mirik one of the must visit spot in the Darjeeling Hills. The Bokar Ngedon Chokhor Ling Monastery is located in Mirik, a small village within the district of Darjeeling, in the northeastern Indian state of West Bengal. 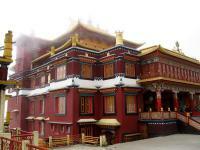 This monastery was established in 1984 by Kyabje Bokar Rinpoche as a retreat centre. It is one of the prominent Buddhist centers in the region. Situated at one of the highest points in Mirik, the monastery offers its warm presence to the village and the lake below. The monastery is home to around 500 monks who participate in practicing and sustaining the teachings of Shakyamuni Buddha. Their schedule includes daily practice and a broad range of studies in Buddhist philosophy and Dharma rituals. It also serves as a school teaching the principles of Buddhism. The monastery has a monastic college named Shedra. Pashupati market- Located on the Indo-Nepal border in the Darjeeling District, your trip to Mirik would remain incomplete if you donâ��t visit this place. An 11 kms drive from the town of Mirik, this market is a heaven for all shopaholics. Its servers as a one stop market region for all kinds of electronic goods imported designer wears etc. Famous for foreign goods, the Pashupati market also marks the getaway to the Kingdom of Nepal. Shop to your heartâ��s content during your family vacations in Mirik. This market is fairly accessible from Mirik. With so much excitements onboard, your family vacations to Mirik is surely going to be a once in a lifetime experience.